Liam Conroy continued his excellent form in August with scores of 168, 120 and 108 not out. He also took 4 for 42 in the game when he scored 108 not out. His form helped Thetford maintain their promotion challenge and they ultimately finished second in Division One. They would have secured promotion if Norwich had not been relegated from the EAPL into the Premier Division of the Alliance. Jake’s bowling stats for July were 6 for 21, 5 for 13, 4 for 28 and 3 for 19. His combined figures for the month were 18 wickets for 81 runs. He also scored 113 not out against Sprowston on the day he took 6 for 21. His performances in July helped Dereham maintain their position at the top of Division 1 and they are now well placed to secure promotion back to the Premier Division. June’s Player of the month is Swaffham Captain Jasper Payne. He followed up his strong performance in May with scores of 50, 153, 16, 101 and 87 not out. Jasper, who opens both the batting and the bowling, is hoping his team can consolidate their position at the top of Division 2 and ultimately gain promotion to Division 1 for the first time in their history. 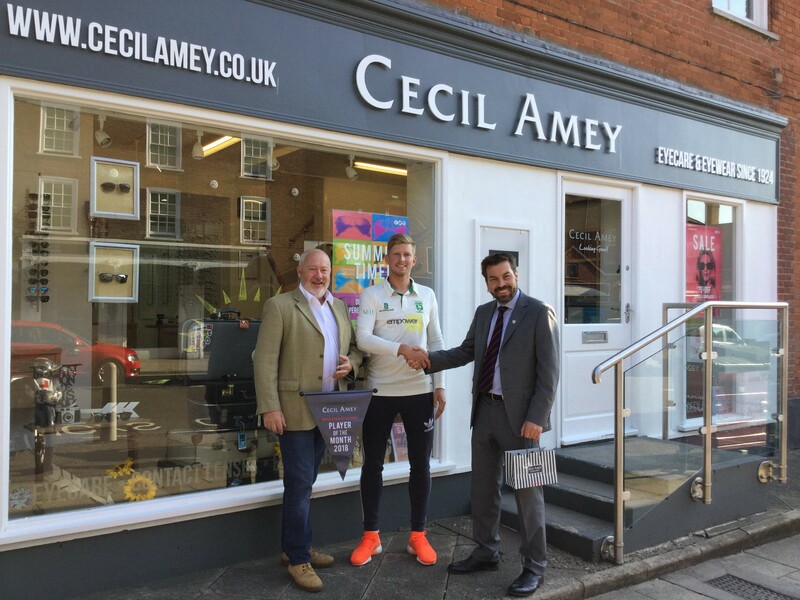 Left to right - Robert Leech - Alliance Sponsorship Officer, Jasper Payne -Swaffham, Andy Lowen - Cecil Amey Operations Director. 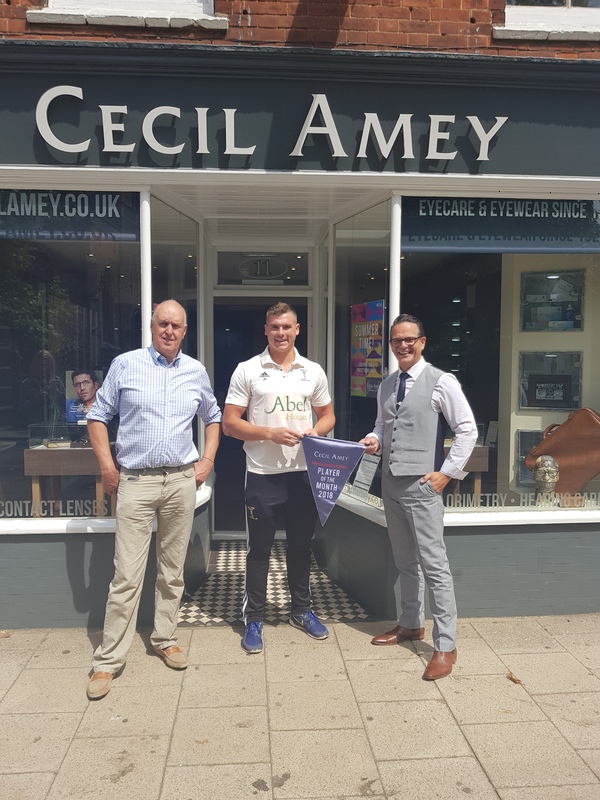 As sponsors of the Norfolk Cricket Alliance, Cecil Amey's Norwich Manager proudly presents the first Player of the Month award to Euan Gilmour from Hockwold. 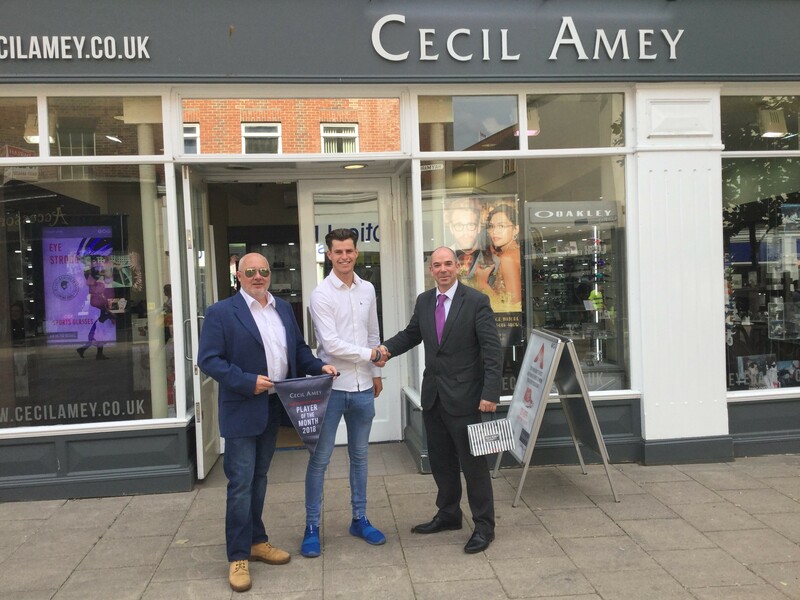 Euan was presented with a Oakley Sport Glasses by Oly Frankel ( Cecil Amey). As opening batsman, Euan scored 326 runs in May with scores of 67,48,103 and 108 not out helping to take Hockwold to the top of Division Four. His good form has continued in June with scores of 82 and 116.